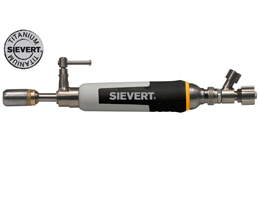 The Pro 95 is the most light-weight soldering iron in the Sievert product range which combines maximum comfort with modern burner technology. A selection of copper soldering bits are available for all kinds of sheet metal work including roofing and gutter soldering. The Pro 95 burner guarantees wind stability without using a windshield. The handle has sliding air control to enable hard or soft settings. Also equipped with a swivel hose connection.